Mahound’s Paradise: EXCLUSIVE: Text of the Votum on Fr. Phillips – Why is the Archdiocese Misrepresenting It? On March 17 of this year it was announced that Fr. Frank Phillips, pastor of St. John Cantius in Chicago and founder and superior of the associated order, the Canons Regular of St. John Cantius, had been removed from public ministry (and thus from his positions as pastor and superior) by Cardinal Blase Cupich, allegedly based on “credible accusations of improper conduct involving adult males.” (The more precise nature of these charges as well as the identities of the accusers has never been officially stated or released.) On June 23, after an investigation by the Congregation of the Resurrection (“Resurrectionists”) – where Fr. Phillips was ordained and with whom he was also still a member – the archdiocese of Chicago declined to reinstate Fr. Phillips and confirmed that his faculties for ministry would remain withdrawn. Though neither the investigation report itself nor any other details were publicly released, it is known that part of the recent decision was made against the recommendation of Resurrectionist Provincial Fr. Gene Szarek, based on the report and the results of the investigation. The contents of the report were said to have “exonerated” Fr. Phillips. What did Fr. Szarek of the Resurrectionists recommend? Did the investigation exonerate Fr. Phillips? We have obtained a copy of the recommendation or votum (opinion) written by Fr. Szarek. It is dated May 21, and thus was, we assume, received by the archdiocese at that time. Those currently closely involved with the case within the archdiocese would presumably have access to it. Although Phillips was not found to have violated any church or secular law, archdiocese spokeswoman Paula Waters said there was other information that warranted his removal and a continued ban on his administering sacraments in public within the archdiocese. Waters declined to detail the findings against Phillips. As we shall see, below, those comments were extremely misleading and arguably constituted outright falsehood. The archdiocese has all along appeared selectively unforthcoming about the entire matter. A blunt observer might be excused for concluding that it is now lying. The text of the votum follows. Essentially it is the conclusion or recommendation of the superior of the Resurrectionists, and thus acts as the cover letter for the 22-page set of findings put together by the three-person review board based on witness testimony. Thus, I suppose “report” might be used to refer to either the findings themselves or the findings plus the votum. But keep in mind that the findings were written by the review board consisting of three laypeople – a judge, an attorney and a psychologist – while the votum was penned by the Resurrectionist Fr. Szarek himself. The investigation was not a “trial” in the sense that some might imagine. Witness testimony was given over two, day-long sessions in April, but no video, audio or stenographic record was made. Rather, notes were taken of the testimonies and then later summarized in the findings. But the findings were not merely a summary of the “raw data” of the witness testimony. While the review board would make no recommendation for action (that was left to Fr. Szarek), it would interpret the evidence as well as often pronouncing on the reliability of the testimony. This post does not include the text of the findings. Will the findings or complete report ever be made public, officially or otherwise? Probably not. Nor perhaps should it be. Among other things, witnesses were promised confidentiality. Some of the testimony of some witnesses (I’m not referring to that of Fr. Phillips or the accusers) was of a private nature that might prove harmful or embarrassing to those very witnesses if it were ever publicly disclosed. That might almost sound like some sort of quasi-frivolous justification for keeping crucial facts secret. I can tell you with full knowledge that it’s not. But I think a fair reading of the findings exonerates Fr. Phillips from the sort of sexual activity or wrongdoing, including homosexual relationships and homosexual advances or behavior, that people have imagined might constitute “inappropriate conduct.” In addition, to put it more bluntly for these charged times, the findings do not establish or even indicate that Fr. Phillips is or might be homosexual. However, the findings do show that Fr. Phillips arguably exhibited imprudence and/or bad judgment in a number of areas. What precisely that refers to will not be discussed in this post. I apologize for that. As for the original charges made by the accusers, the findings were quite clear that they were not credible. A recent press release from the independent parishioners group Protect our Priests, written by someone who had obviously read the report, made reference to the “mendacity, falsehoods, spitefulness and malevolent connivance” of the accusers. Without directly commenting on the character or motivations of the accusers in this post, I can say that this interpretation (at least for one or two of the three accusers) is not inconsistent with the findings. Though of course, the purpose of the votum was not to pronounce on that. Actually, the Review Board made no recommendation either way. It was not their role to do so. But it did claim as part of the findings that the original accusations were not credible. Waters did not mention that. Fr. Szarek recommended that Fr. Phillips be restored to full canonical faculties. Waters did not mention that. Fr. Szarek recommended that Fr. Phillips remain as superior of the Canons Regular. Waters did not mention that. One might argue that Ms. Waters had no obligation to mention those points, though, obviously, using only one part of the votum to support a decision that contradicted the recommendations of most of the votum is misleading spin of the highest level. Is this how the Archdiocese would publicly conduct itself? I think it’s reasonable to view the votum as in part an attempt at compromise. Fr. 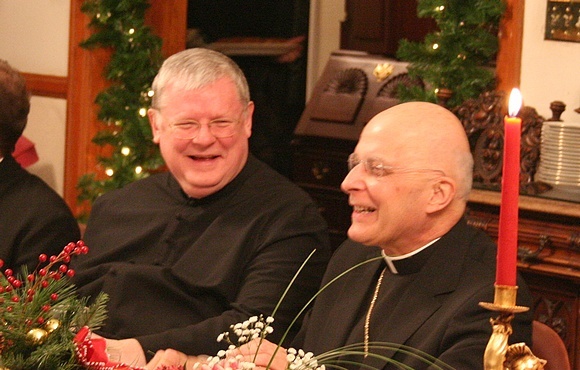 Szarek (one imagines) knew Cupich was determined not to allow Fr. Phillips to return as pastor. So he tried to salvage the best he could for Fr. Phillips, thinking the contents of the findings would support that. Note again that the votum was written a month before the decision was made by the archdiocese. For weeks, the rumors among some Cantius parishioners were that Fr. Phillips would be “retired” in a benign or quasi-benign fashion. It is now clear where those rumors originated. I imagine that the much more severe final decision of the archdiocese was a rude surprise to Fr. Szarek, just as it was a rude surprise to many parishioners. One assumes that Cardinal Cupich also required Fr. Szarek to write or at least sign his name to the terse note enclosed in last weekend’s bulletin, the final execution notice, if you will, for his fellow Resurrectionist. OF THE PROVINCIAL SUPERIOR IN THE MATTER OF FATHER FRANK PHILLIPS, C.R. 1) IMMEDIATE ASSESSMENT: Because of a certain amount of ambiguity between the allegations of the accusers and the testimony of witnesses, including Fr. Phillips himself, I will be instructing Fr. Phillips to undertake a psychological assessment and possible sensitivity training in the very near future. 2) PASTORATE: Because of his age (68) and out of respect for the Cardinal’s own preference, I judge that Fr. Phillips should not return to the parish as its pastor. 3) CANONICAL FACULTIES: Because no civil or ecclesiastical crime has been established. It’s seems fair and just to restore the canonical faculties of Fr. Phillips. His accusers, when asked what should happen to Fr. Phillips as a result of their accusation, thought that his removal from the parish was all that they desired (see report, in various places). 4) SUPERIOR GENERALSHIP: This is a sensitive issue. As Founder of the Canons Regular of St. John Cantius, the ideal would be his restoration as their superior general. Because the Canons are ordained for the Archdiocese of Chicago and because all major superiors of men merely recommend or nominate priests for appointments, which are made only by the authority of the Archbishop, there is no fear that Fr. Phillips could possibly interfere in some way with the decisions of the Archbishop. The historical reality of his being the Founder and his ongoing provision of spiritual leadership would be salutary for all. He would obviously not reside at the parish (see #2, above), but at some place determined by his Resurrectionist major superior. If the above recommendation is unfeasible, then at least he and the Canons should not be prevented from communication. www.RestoreAmericanLiberty.com teaches the critical relationship between human virtue and freedom and applies this principle to the social and fiscal issues facing America today using best-in-class technology. Our email list is private and not disclosed to any third parties.